Office telephones need to be versatile and reliable to make sure that your staff can work well. Indeed, quality communication is at the heart of every modern office - a quality office phone system is the first tool in achieving this. This page focuses on office phones, the models available, and the features that these models offer to your office. These features have already convinced more than a third of UK businesses to switch to cloud PBX or on-premise IP PBX VoIP phone systems, and three-quarters of those businesses in the market for a new phone system are looking to install a cloud-based system. 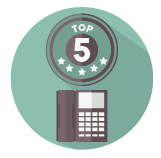 If you want to find an office telephone system with features to suit your business and staff, you should complete the form at the top of this page. It only takes a minute, and comparing quotes with Approved Index could save you as much as 40% on your purchase, lease or rental. An office phone system is essential for any business that requires quality communication with people outside of their work environment; whatever size your business is, and whatever service or products you provide, ensuring that you have the right means of contacting and connecting with staff, clients and customers is essential. The range of office phone system features available allows businesses to perform a range of functions with ease - from sales staff to customer services, quality office phones mean that you can operate at maximum efficiency. 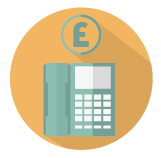 As well as providing a range of features, there are are also office phones available to match a range of budgets - from the lower cost, basic feature office phone to the high-cost but advanced option, there is certain to be a telephone to suit your staff requirements. Furthermore, if you need to install a telephone system for your entire office, or for multiple office locations, there are UK suppliers that can offer excellent deals. 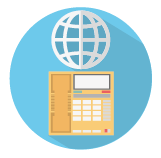 Understanding what options are available is the best way for your business to find the perfect office phones. Comparing options is essential to this process, and we have tried to help by comparing some of the top office phones in the table below, and also throughout the rest of this page. The table below specifically compares 5 of the best office phones - the prices and features vary, but between the options, there should be enough range to suit every style of business - for even more information, you should continue on down the page to compare other important features.